On July 28 2009, a pair of iPhone applications that offered support for Google Voice were unceremoniously, and without warning, removed from Apple’s App Store. We then learned that Apple had blocked the official Google Voice application as well, which eventually led to an FCC inquiry. A year later, Google Voice was still missing from the App Store. Now it looks like there may be a glimmer of hope for getting Google Voice on your iPhone. This morning Apple released guidelines explicitly spelling out for the first time what it would reject from the App Store. Sean Kovacs, the developer of third party Google Voice application GV Mobile (which was removed from the App Store over a year ago), read through each of the 100+ rules, and he concluded that his app didn’t seem to violate any of them. He emailed Apple’s approval board to see if he could possibly get his app reinstated. The response was encouraging. 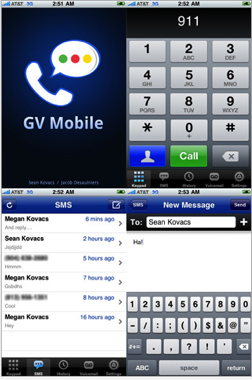 I reached out to Kovacs, who says that an Apple representative responded that given the new guidelines released today, he was welcome to resubmit GV Mobile for review. Which is a much better response than he’s been getting before now (radio silence). Of course, nothing is certain yet. This could be a case of an App Store reviewer stepping out of line and making a mistake. It’s possible that Apple will say this violates rule 8.3, which states “Apps which appear confusingly similar to an existing Apple product or advertising theme will be rejected” (this is similar to the “reducing functionality” explanation that Apple gave to the FCC last summer). Or it could mean that Google Voice, albeit from a third party application, could finally be making its way back to the iPhone. We’ve reached out to both Apple and Google to see if there has been a change and will update when we hear back.